The term woodlot typically refers to a plot of privately owned forest land. In British Columbia, there are an estimated 20,000+ woodlot owners in the province which have forest holdings greater than 20 hectares. 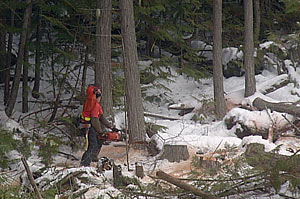 A woodlot licence is a form of area-based tenure awarded by the Province of BC. A licence is issued over a specified parcel of crown or publicly owned forest land. The maximum amount of crown land in a woodlot licence is 1200 hectares in the interior and 800 hectares on the coast. In addition, a woodlot licence may include some private land. This type of tenure is unique to British Columbia. It is a partnerships between the licence holder and the Province of British Columbia to manage public and private forest lands. The very first woodlot licences in British Columbia, commonly called “farm woodlots”, were introduced in 1948 to allow farmers and ranchers access to Crown timber as a means to supplement their income. 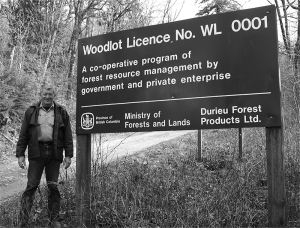 The present woodlot licence system was introduced in 1979. It allows individuals or organizations who qualify for a licence to manage up to 800 hectares (on the Coast) or 1200 hectares (in the Interior) of Crown land often in combination with their own private land. Woodlot licence holders are given the right to harvest timber. In return, they take on the responsibility of sustainably managing the forest for all of its values on behalf of British Columbians. Woodlot forestry is an alternative approach to administering and managing some of our Crown forest lands and has slowly grown since 1979 to 870+ Woodlot Licences today. A diverse group of individuals and organizations with a wide range of backgrounds has been attracted to the woodlot licence program. It includes ranchers and farmers, forestry workers such as fallers, logging truck drivers and registered professional foresters (RPFs), but also scientists, engineers, First Nations, educational institutions and many others with an interest in managing forest land. Woodlot licensees all have one thing in common: a love of the forest and working outside. They are dedicated to managing the land and forest included in the woodlot licence to the best of their ability and with special attention to the environment and ecological values of the forest. Their woodlot licence is a source of personal pride and accomplishment. Many woodlot licences are located in areas where the natural forests interface with urban development. Their location allows for unique opportunities for British Columbians to personally experience the land and the industry that has sustained the province for over 150 years. While they produce timber, woodlot licensees also keep the land accessible and attractive for recreation. Throughout the province woodlot licensees are demonstrating leadership in managing forest land for all of its values: economic, environmental, recreational, educational and more. The forests are in good hands with woodlot licensees. Woodlot licences are small, area based forest tenures unique to BC. In effect it is a partnership between the license holder and the Province of BC to manage public and private forest lands. A woodlot licence is a replaceable tenure that is awarded for 20 years. Replaceable means the tenure will be renewed or extended, providing the terms and conditions of the agreement are being met. As such, woodlot licenses are often passed on to generations within a family. Woodlots often marry private lands with Crown lands. For older woodlot licenses the maximum crown land portion was 600 (interior) or 400 (coast) hectares of crown land, creating an unique forest tenure. Recent changes in forestry legislation increased the maximum allowable Crown land portion to 1,200 and 800 hectares, interior and coast respectively. In BC, there are roughly 600,000 hectares included in woodlots, of which ~91,434 hectares or ~17% is private property. There are approximately 865 active woodlots in British Columbia with an annual allowable cut (AAC) of ~1.579 million cubic meters annually; or ~2.3% of the provincial cut. There is no differentiation between the private and Crown land when it comes to management. Both are managed to the same high standards. A woodlot holder cares for the crown land in the same way they care and tend to their private land. Woodlots are a form of small business, each one helping to support one or more families. Woodlots are typically handed down from generation to generation within a family. Woodlot holders assume responsibility for managing the woodlot area, taking a long-term approach to the sustainable management of all resource values. Woodlot holders invest a significant amount of personal time and effort into managing their woodlots. On average a woodlot holder invests 45 man-days of personal time. A woodlot is a source of personal pride and accomplishment. Woodlot holders have close ties to their neighbours and to the local community within which they reside and manage their woodlot. Since woodlots offer ‘personal’ management on a small-scale, many have purposely been located in close proximity to communities and residential areas or over areas with sensitive resource management issues. Each woodlot generates a significant amount of full time, part time and seasonal employment including jobs in planning, harvesting, road construction & maintenance, reforestation, silviculture and small-scale timber processing. 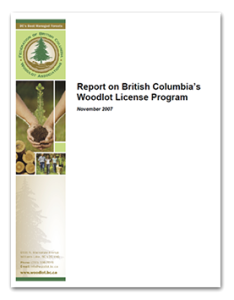 This report is on BC’s woodlot program and provides many interesting facts and figures. It also includes a brief history, examples of excellence in forest management and socio-economic contributions woodlots and woodlot licences make in BC.